The biggest innovation in rice cooker technology today is the fuzzy logic rice cooker. A fuzzy logic rice cooker contains a computer chip that allows it to carefully modulate the cooking time and temperature of your rice. Standard rice cookers only ‘know’ to heat the rice at a set temperature until a certain amount of water has been absorbed, but fuzzy logic rice cookers can make complex adjustments to the cooking process as it goes along. For example, on a cold day, the cooker will ‘know’ to adjust its cooking temperature upwards in order to ensure consistent rice. A fuzzy logic rice cooker will also have many different settings for the type of rice or grain used. A leader among fuzzy logic rice cookers is the Zojirushi rice cooker. Zojirushi is a Japanese company known for their attractive, high-tech kitchen wares, and their rice cookers are among their most popular products. 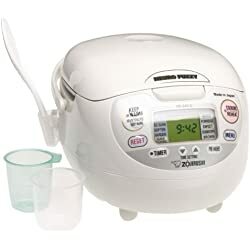 One of Zojirushi’s most popular rice cookers is the Neuro Fuzzy Rice Cooker and Warmer, which comes in a 5.5 cup and 10-cup model (model numbers NS-ZCC10 and NS-ZCC18). This rice cooker can function as a white rice, sushi rice, porridge, oat, or brown rice cooker, and features ‘keep-warm’ settings which can keep your rice warm and moist for hours, and can even reheat cold rice without overcooking it or drying it out. It features a retractable cord and an LCD display face, as well as a Teflon-coated removable inner pan for even heating and easy cleaning. It comes with two rice measuring cups and a cooked rice scoop with holder. The 5.5-cup model measures about 14 x 8 x 9 inches, while the 10-cup model measures about 11 x 9 x 10.5 inches. Another Zojirushi rice cooker is the Zutto Neuro Fuzzy Rice Cooker and Warmer, which comes only in the 5.5 cup size. Similar to the standard Neuro Fuzzy cookers, the Zutto rice cooker was designed by a Japanese interior designer and is intended to fit into the most modern and stylish households. Its buttons are marked with symbols rather than labels, for universal understanding, and it has settings for white and sushi rice, mixed rice, and porridge. Customer reviews indicate that the Zutto can also be used as a brown rice cooker. The Zutto Neuro Fuzzy Rice Cooker measures about 13 x 9.875 x 7.875 inches. Other than that, its features are the same as those of the standard Neuro Fuzzy line. Many users say that these models of Zojirushi rice cooker makes the best rice they’ve ever tasted, no matter the type. Especially notable is the Neuro Fuzzy Rice Cooker’s effectiveness as a brown rice cooker; even people who have always thought they disliked brown rice report that they have been won over by the brown rice prepared by these cookers. Many people also use them to make steel-cut oats. Customers also love the ease of use of the Neuro Fuzzy Rice Cookers; despite their high-tech appearance, cooking and cleaning are both a breeze. One thing to keep in mind is that the listed capacities are not in imperial cups- the cups referred to are the cups included in the package, which are around six ounces, rather than the eight ounces of an imperial cup. Additionally, it’s important to note that these rice cookers take longer than a traditional rice cooker. Fuzzy logic rice cookers provide restaurant-quality rice at the push of a button, and Zojirushi rice cookers are premium examples of these. Anyone interested in taking their homemade rice dishes to the next level should consider Zojirushi for their next rice cooker.